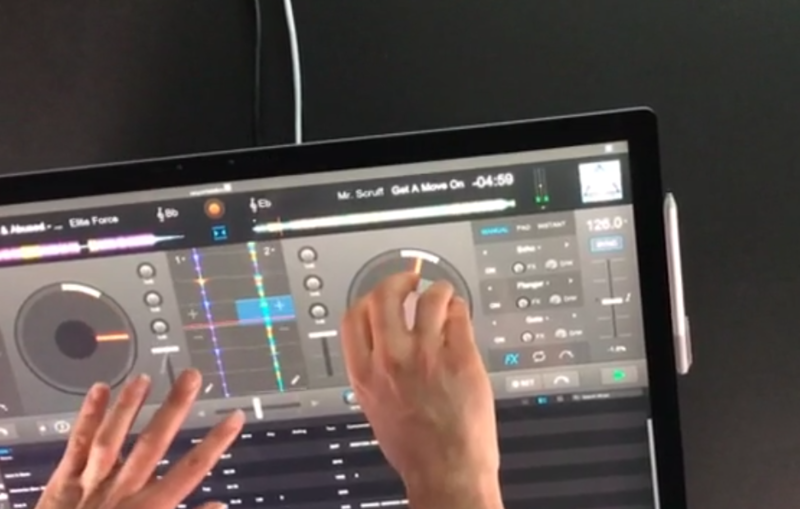 So, Algoriddim’s djay has been quietly morphing from “nifty entry-level Mac DJ tool” into “holy, crap, this is actually kind of better than the other DJ software.” And now, a ground-up rewrite for Windows 10 points to where music software might go on that platform – namely, touch and other novel input. I’ll review the state of djay Pro soon. I think its clean interface and its open support for hardware (including Pioneer’s) are reason serious DJs should give it a second look. And in particular, it comes at a time when some leading competitors focus more on supporting their own hardware ecosystems than providing open access for everyone to customize software easily for their own needs. 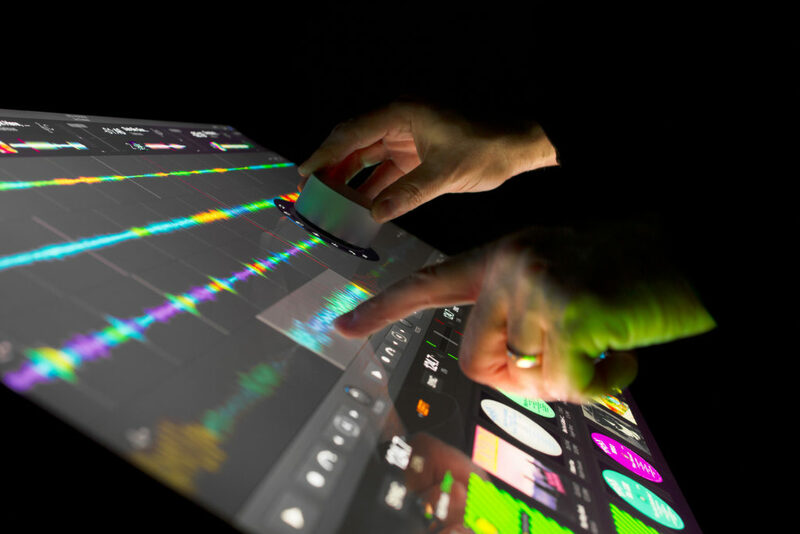 But, while I’m not yet suggesting I think you’ll see people dragging Surface Studios into DJ booths with them, the Surface support is at least interesting. Surface Pro and Surface Book are already interesting in that, unlike the iPad, they assume what you really want is a desktop OS and all your favorite desktop software, combined with touch input. Contrast that to Apple’s approach, which is still to allow only a narrow, single touch Touch Bar on their pricier laptops. If you’ve used djay on iOS, you know what the touch side of this looks like. And in a nod to Microsoft’s efforts to woo Apple platform developers to Windows, Algoriddim even used Microsoft’s Windows Bridge for iOS — meaning this actually is software from iOS ported to Windows, but with a more Windows-native feel (and full hardware support). The new bit is what the Surface Dial brings to the equation. In addition to touching controls directly, you can twist the Surface Dial for more precise parameter control. So that means you can nudge settings on the mixer, the crossfader, effects, or whatever you choose. The workflow there would be to touch what you want on the touchscreen (maybe with one hand), then make more adjustments with the Dial. Move the Surface Dial onto the Surface itself, and other capabilities are unlocked. Move it over the library, for instance, and you can scroll through your music collection and even press to load a track. Algoriddim provided a private demo video showing how the Surface Dial works. You can actually use it directly on the touchscreen. Move it onto a deck, and you can dial into a mode (scrub, scratch, filter, loop) and then manipulate that deck directly. Prediction: whether this catches on or not, someone somewhere is going to do a convincing set on it. In a fairly uniform field, it’s also an easy gimmick – and, frankly, given that music is entertainment, I don’t think there’s anything wrong with that. But even if you hate the concept, there’s more here. Other music apps could find other uses for this, continuing to grow beyond the keyboard/mouse interaction model. And it demonstrates Algoriddim’s flexibility – something they also apply to more conventional MIDI hardware and Pioneer DJ gear, for instance, if that’s more your speed. This is also an appealing tool for doing some music organization, because it has Spotify integration. Now with even a lot of small, underground labels doing distribution on Spotify, I find I’m often digging through new releases there, and I’m sure I’m not alone. I wouldn’t expect DJs to trust that in venues, unless they’re in the thankless position of being somewhere they have to take requests, but even if you’re not a wedding DJ, this seems to have track prep implications. djay Pro running on Surface Book, with screen detached. 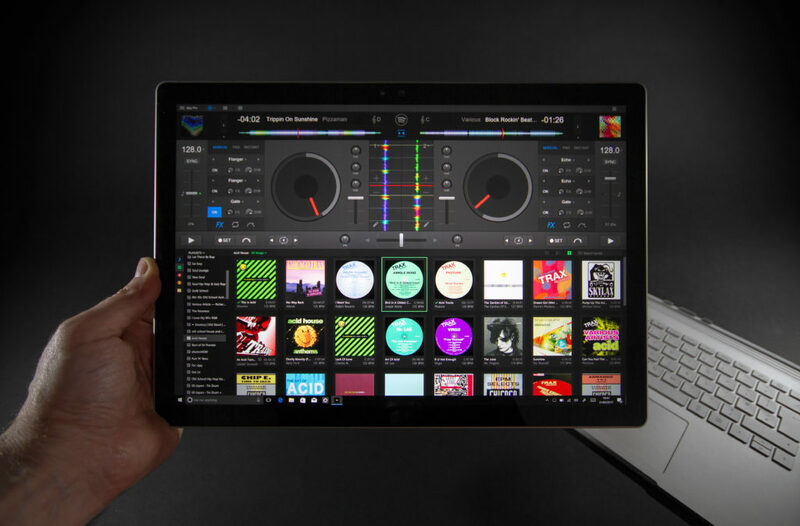 So, djay Pro is looking like a potentially serious contender on Windows, one that could play with the big kids for less money and with less hardware lock-in. More on this soon. Accessibility side note: One immediate question I have is how Surface Dial is working for people with different physical abilities – or even whether a more suitable Bluetooth accessory could be provided. For anyone scoffing at touchscreens for DJing, I know already these work for differently-abled people unable to work with conventional pots and the like. We got to host one such DJ at our hacklab in January, and watch him DJ in Berghain. I believe people should be able to express themselves freely with DJing whether they’re professional or not, and that the professional field should be constrained by DJing ability rather than physical abilities. More on this soon. Official video which … uh … made me want to mute the audio, but here you go!